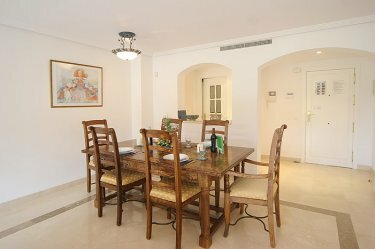 This spacious fully air conditioned luxury 3 bedroom penthouse apartment has been furnished to a high standard and has lots of indoor and outdoor living space. There are 2 bathrooms, one en suite and the 2ndwith a hydro massage power shower and both with the Roca luxury range. The modern kitchen is fully equipped with Bosch appliances and the separate laundry area has a Bosch washing machine and tumble drier. The master bedroom has a large double bed and the patio doors lead onto the balcony, the 2 further bedrooms both have 2 single beds in each. Sleeps Maximum of 6. All bedrooms have fully fitted wardrobes and a there is a Safety deposit box in the master bedroom. The comfortable lounge has 2 sofas , dining table and chairs that seats 6, TV, DVD player and basic sky package. The double patio doors lead onto the lower terrace which has a table and chairs and the roof solarium benefits a table and chairs that seat 6, sun loungers and a BBQ. Stunning golf and sea views. 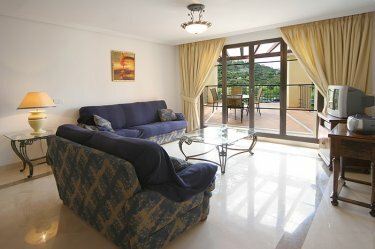 Situated within beautiful communal gardens, the apartment benefits from two superb communal pools and a childrens pool. Las Jacarandas is a gated urbanization with private parking bays and lift access. A 20% deposit is required to hold the apartment and then the Balance is due 8 weeks before arrival. A security deposit of 200 GBP which will be sent back to you within 7 days of departure once the apartment has been checked.